The project came out of the Sorrell Foundation’s ‘joinedupdesignforschool’ programme where pupils are given control and responsibility as clients. From inception through to completion, the project team worked directly for a client team of 11 pupils selected from years 9 and 10. This pupil client team took all design and budgetary decisions. They presented their brief in the form of a play. This called for an extension to the existing 580sqm Design & Technology studio, to create a new space for developing conceptual and design ideas away the noise of the workshop. They wanted a building that acted as a landmark for the school and that would demonstrate best practice for environmental design. 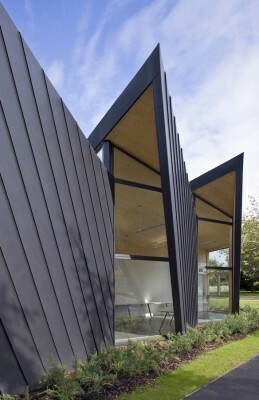 The 95sqm extension is a solid prefabricated cross-laminated timber construction with the timber exposed to the interior and standing seam pre-weathered zinc to the exterior. 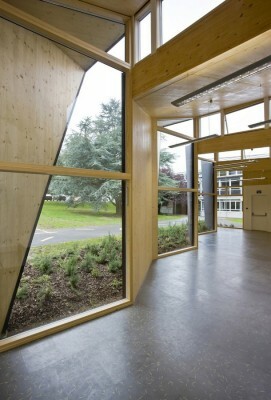 The timber structure was chosen for its environmental performance and was designed with half lap joints and has no visible fixings in the building. The ceiling within the extension rises from 3.2m to 5.2m, allowing even north light to flood the space, and creates the distinctive saw-tooth form of the building. The only steel structural elements are T-sections that support the ridge of the roof panels from the timber beams below. Specialist contractor KLH manufactured the timber structure off site and this was the first time the system had been used in the West Country. This modular construction method meant that the structure was assembled on site in under two weeks. 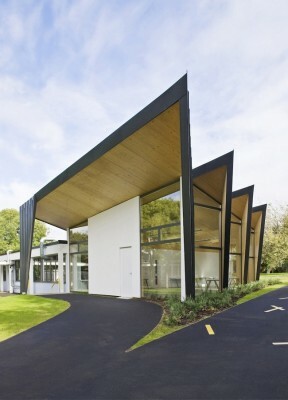 The existing Design & Technology studio was upgraded as part of the scheme. The refurbishment rather than wholescale removal of the existing workshops had the added benefit of less waste and lower embodied energy in building materials required. Coupled with the use of the prefabricated elements this lead to less construction time and less disruption to students and their education. The existing block now has a new roof, wood-fibre insulation, double glazing to prevent heat loss in winter and solar shading to the south of the building to prevent summer overheating. Other sustainable materials chosen include a lime-based render, recyclable zinc cladding and natural rubber for the flooring. The main planning constraints that the design team faced were regarding the safeguarding of trees on site. Tree protection was installed on site and two trees that required removal were replaced with the same species once work was complete. The key innovation within the project was in the unusual commissioning process and the involvement of the school pupils as clients. The design team had to be inventive in developing engaging ways for the pupil client team to understand and interrogate their work. This meant structuring the programme around the pupil client team’s school timetable. Due to a tight lead-in time and the necessity to keep the school workshops in operation the whole team had to work efficiently to deliver the building on time and to ensure major project milestones were programmed within term time. Since the design and detailing of the timber panelling were resolved and the timber panels procured, the construction period ran to 22 weeks. Starting with the casting of the foundations in March 2008 to the completion of the building in August 2008. The original design & technology block was in use for lessons throughout the construction phase. Furthermore, the new design studio had to be operational in time for the start of the new academic year in September 2008. 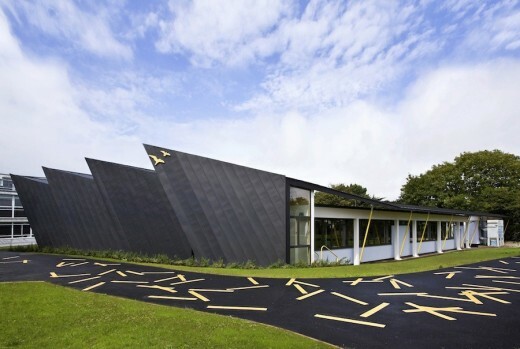 The project had a total budget of £550,000, with funding from Central Government (£239,000), the school (£156,000) and Cornwall County Council (£155,000). 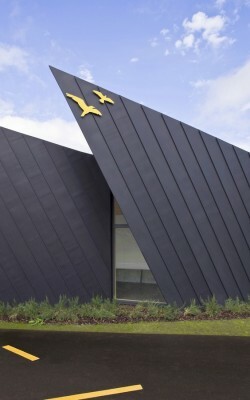 Although the initial scheme incorporated a wind turbine, budget considerations meant that the pupils decided to exclude this from the final scheme. However, they decided that they would fund raise for this separately and take charge of consulting the school’s neighbours, carrying out noise surveys and applying for planning permission. Successfully winning planning approval and grants from several sponsors, the school placed an order for the wind turbine in February 2009.